I was an at a very exciting launch today for The Great Irish Bake Off, starting 9pm Thursday 19th September on TV3. The main reason I'm so excited for this show to start is because my fiance Will De Korte is on it!!! ARGH!!! It has honestly been the hardest secret to keep ever. I'm so proud of him for making it to the show that I have wanted to tell the world for so long and now I finally can! The launch took place this afternoon in the Merrion Hotel and holy moly, my jaw hit the floor when I saw the cakes that greeted me when I walked into the room. My favourite cake was the tall cake in the centre of the table. Mainly because Will's photo was on it. This cake was also pretty amazing too. Fancy or what! We were so lucky and got to watch a few minutes of the 1st episode and I can honestly say it looks amazing. I'm like a child counting down the days till Christmas, counting down next Thursday!! It was great for Will to catch up with all the other contestants, who are all so so lovely too. You can watch Will's profile about himself on the TV3 website here . You can also watch the rest of the contestants profiles here too. You can find Will on twitter under @Willem_deKorte where he will be tweeting all things cake and bread and you can also find some recipes over on his blog - The Cook's Belly. Can everyone please wish Will the very best of luck and you can find all tweets about him from Thursday under the hashtag #teamwill. Come on Will!!! SCREAM! oh my goodness good luck to him! 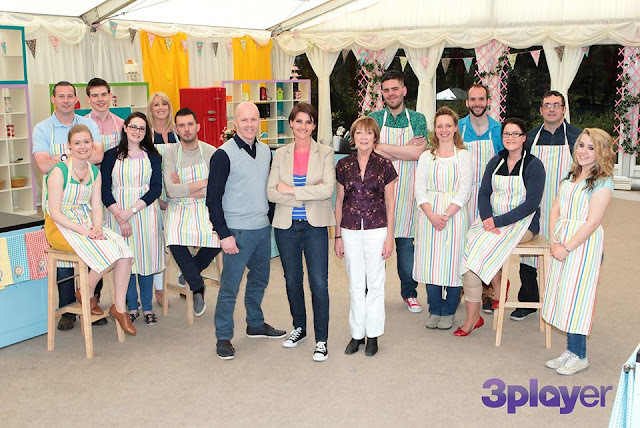 I dont know if I can get that channel but I'm going to try, I love me some Bake off, come on team Will! Argh, so exciting! Best of luck to Will! fantastic news joanne!! G team WILL!!! !